The Confusion boats which are located at Northpoint Marina which is 1 Hour North of Chicago in Winthrop Harbor, IL offer a weekday (Monday thru Thursday) economy charter for small groups of 1 to 2 persons on limited availability . It is one of the most beautiful and largest marinas on the Great Lakes. 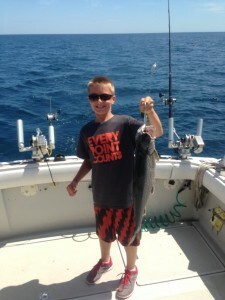 When charter fishing for Salmon and Trout on Lake Michigan there is no better destination. These boats are full 6 person charter boats and have great success on the water. The season starts in April and goes thru October and there is fine fishing throughout the season. There are better times of the year for particular species but overall there is always something biting. Average catches mainly consist of Coho Salmon and King (Chinook) Salmon but Lake Trout, Brown Trout and Steelhead (Rainbow Trout) are around and at times plentiful. An average catch can be from 10 to 20 fish per trip with a maximum of 5 per person limit.